I fell in love with these big-headed girls with big hearts in summer 2003. Ever since Blythe came into my life, I have been dabbling in photography, sewing, and knitting, things I never thought I would be into. I've also been very lucky to have met some wonderful people who have become great friends. I live in sunny Los Angeles, California with 23 Blythe girls. I am a big believer in staying young and happy at heart - keep playing with your dollies and you'll never grow old! 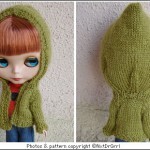 Free Knitting Pattern: NxtDrGrrl Hoodie! Hey Blythe knitters! The long-awaited NxtDrGrrl pattern is now available here at PuchiCollective! The pattern can be viewed here. Enjoy! Thanks so much for sharing with us, Paula! Just added a basic a-line dress pattern for LaTi Yellow doll. Go here to download!